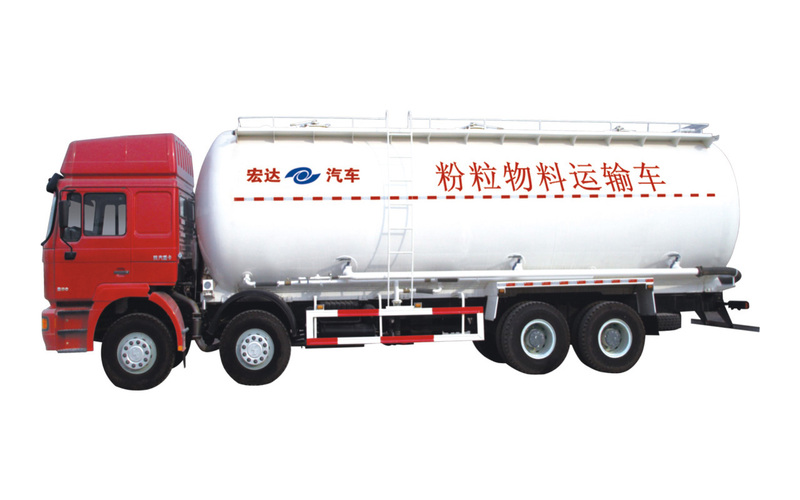 It is Suitable for powder dry bulk transport of materials such fly ash, cement, lime powder, mineral powder and granular base whose grain diameter is not more than 0.1 mm . It is Mainly used for cement, cement warehouse and large construction sites that can save a lot of packaging materials and loading and unloading work. Tank is mainly composed of barrel, the top of tank for inlet, fluidized bed, the material of the tube assembly, intake pipe and other accessories, top of the tank is equipped with two or three mouth to feed. In the front of bulk cement and the back of air chamber all set an air inlet pipe, can be realized respectively by ball valve opened at the same time and separated control. Working principle of the system are as follows: motivation draws out from the car gearbox, through the transmission device drives the air compressor and the compressed air in the gas pipeline interior control, makes the tank of powder material produces fluidization phenomenon. When the pressure is 0.196 Mpa, open the discharge butterfly valve and then discharge. 2.Tanks use straight-through type or Y type fluidized bed to optimize the external and internal structure of tank, with a low center of gravity, large volume, etc. 3.Used for fly ash, cement, lime powder, powder ore, such as particle diameter of not more than 0.1 mm dry powder material transportation and unloading. Fuel consumption 34.38; 35.23; 36.34; 36.31; 36.96.